Walking Poles Food and Drink Just Starting Out Walking? Footwear suitable for walking comes in many forms. Trainers are ok for gentle strolls but are usually not waterproof, although if you are prepared to pay enough, GORE-TEX trainers are available.. Walking shoes are better but if you are venturing on to rougher ground and especially on to the fells/hills, boots are most strongly recommended. They provide support to the ankle, give better grip, keep your feet dry and reduce the feeling from sharp stones beneath your feet. Buy a reputable make from a reputable outdoor supplier, not a fashion outlet which might sell a walking boot look-alike. Wear your normal walking socks when trying them on. Feet swell during the day so buy in the afternoons if you can. Now which boots to buy. Buy the best you can afford but fit and comfort are most important. You will have them on most of the day after all. If money is tight buy reasonably priced but proper walking boots. They should still give support and be reasonably waterproof. Any boots are likely to be better for the purpose than trainers. It is worth having lighter weight fabric (but waterproof) boots for summer use in dry, relatively gentle conditions. These will usually have GORE-TEX or similar breathable material. However for winter or walking in rough stony terrain, leather boots are recommended. If money is tight, go for cheap leather boots rather than fabric and waterproof regularly. Two season boots are lighter weight and suitable for most late spring/summer/early autumn walking. Three season boots are more rugged and suitable for most things except extreme winter walking. Better quality (including leather) boots have GORE-TEX lining to really keep your feet dry. Three season boots will probably have stiffening and be suitable for crampons of the right sort. B0 Boots - more flexible - unsuitable for crampons. B3 Climbing and mountaineering boots - fully stiffened soles - suitable for articulated or fully stiffened crampons with strap or clip-on systems. B3 boots can take C1 or C2 crampons. Boots need to have sufficient space at the front so that toes do not stub on downhill descents.Try to find an outlet which has a slope arrangement so you can try them in a "downhill mode" to check this. Look after your boots. Clean immediately after use. If wet (either from the fells or scrubbing clean), stuff with newspaper to absorb the moisture and if possible put in a well ventilated place. Do not dry close to a source of heat as leather boots especially will eventually crack. Waterproofing should be periodically applied in accordance with the manufactures instructions. It may be worth buying some when you buy the boots as the retailer might be persuaded to throw it in as part of the deal. If the boot manufacturer produces a specific cream/wax for their boot, use this as it will have been specially formulated. A word on tying walking boots. 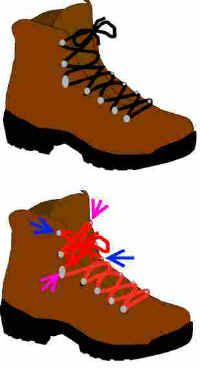 The top of the two pictures on the right shows the typical way in which a boot is tied. Laces are crisscrossed alternately and tied in a bow across the top set of lugs. Some people and/or with some boots find the tight band which results across the top of the boot uncomfortable when the foot tries to bend on walking. An alternative method is shown in the lower picture and is one I use. The laces are crisscrossed in the normal manner until the third set of lugs from the top. 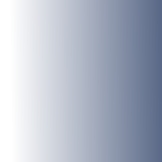 They are then crisscrossed directly from the third set to the top (blue to blue and lilac to lilac arrows as shown) then crossed back to the second set of lugs and tied there. This allows a little more give across the top. And the last word on boots is really a safety issue. Some laces on boots are quite long so that when tied in a bow, even a double bow, a large loop results. It is very easy for this loop to catch in the lugs on the opposite boot as you walk resulting in a very unexpected and incredibly fast headlong meeting with the ground (as my wife can testify - and it hurts - she got the cuts and bruises to prove it!!!). Either shorten the laces, tie them in a triple or even quadruple bow to keep the loops small or tuck them in somehow. Maybe go round the lugs a couple of times if the laces will fit. Visit the Happy Hiker Hiking Store to buy boots.